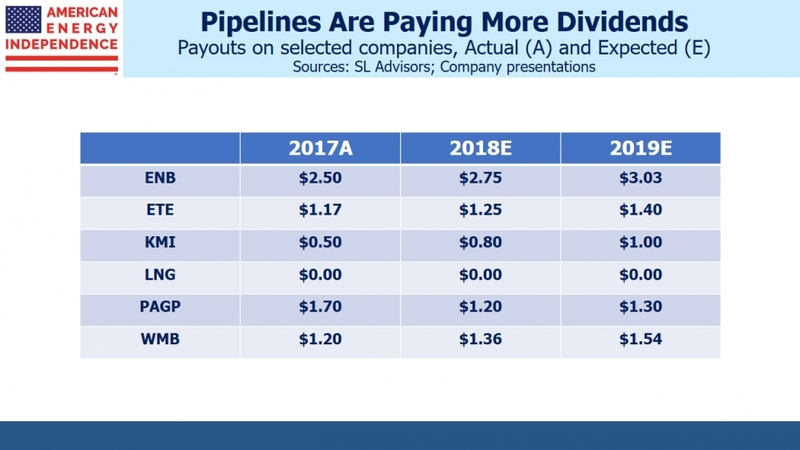 The chart below is a sobering one for pipeline investors. 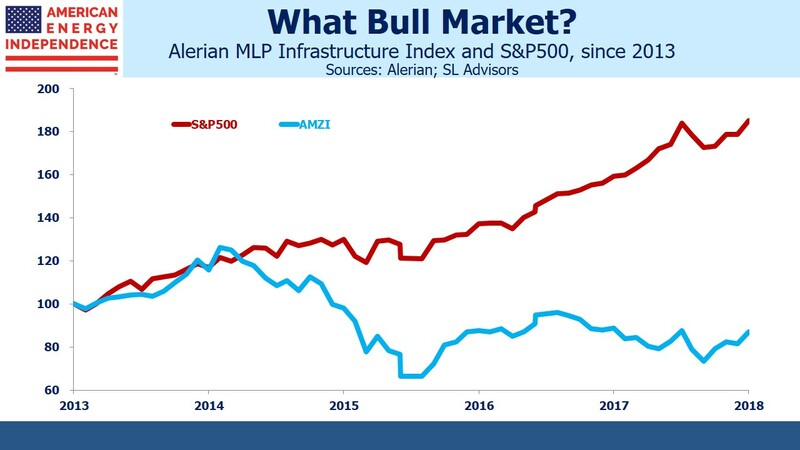 Over the past five years, the S&P has returned 13.1% p.a., versus -2.7% for the Alerian MLP Infrastructure Index (AMZIX). An allocation to AMZIX contributed almost a 16% p.a. performance drag, such that $100 invested in the S&P500 in July 2013 would now be worth $185 rather than $71. The Alerian MLP Fund (AMLP) did 1% p.a. worse than this. Starting in 2014, oil prices collapsed and MLP unit prices followed. As a consequence, energy infrastructure has a correlation with the S&P500 of only 0.63, which makes it an interesting diversifier. Cuts in payouts to fund growth were poorly received by an income-seeking investor base (see It’s the Distributions, Stupid!). Sentiment remains cautious. However, there are growing signs that pipeline companies have turned the corner. Dividends have started growing again. 2Q18 earnings were full of upside surprises, as higher volumes drove profits. 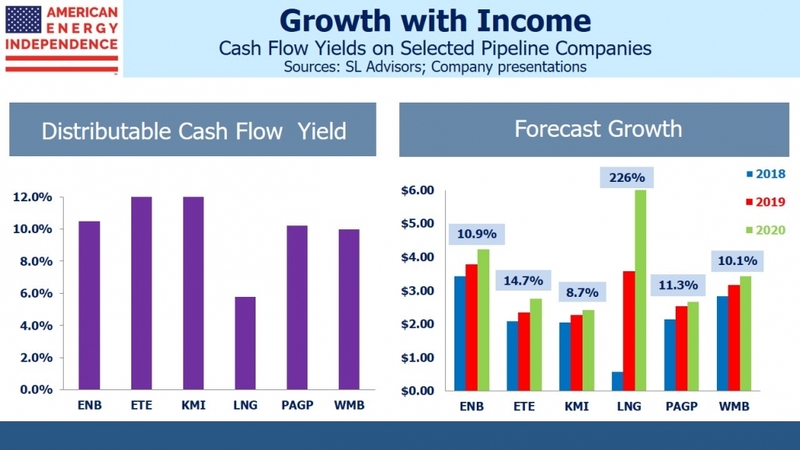 Energy Transfer Partners (ETP) telegraphed a good quarter when discussing its combination with Energy Transfer Equity (ETE), (see Running Pipelines is Easy). Their Distributable Cash Flow (DCF) duly came in 17% ahead of expectations, in part through higher capacity utilization. Analysts expect to see 15% annual growth in DCF over the next two years. Enterprise Products (EPD) reported a 2Q18 EBITDA beat of 13%. Enlink Midstream, LLC (ENLC) provided higher 2019 guidance. Kinder Morgan (KMI) is reducing leverage faster than expected due to its sale of TransMountain Pipeline to the Canadian government. DCF at Cheniere (LNG) is expected to grow 3 fold over the next two years as Liquefied Natural Gas exports take off. It was hard to find any bad news. Many of the biggest MLPs have converted to corporations, which makes the Alerian MLP Indices less representative of the sector than in the past. Last year we launched The American Energy Independence Index, which holds a diversified basket of the largest North American pipeline corporations, along with a handful of big MLPs. It yields over 5%, and we expect DCF growth of 15-20% annually through 2020. This will support healthy dividend growth as well as improved coverage ratios. This resumption of dividend growth is attracting investors again, which has helped the sector to a higher YTD return than the S&P500. Energy infrastructure offers a low correlation with the market, as well as being attractively valued with improving fundamentals. Adding pipeline exposure can improve a portfolio’s prospects while adding some diversification. We are long EPD, ENCL, ETE, KMI.